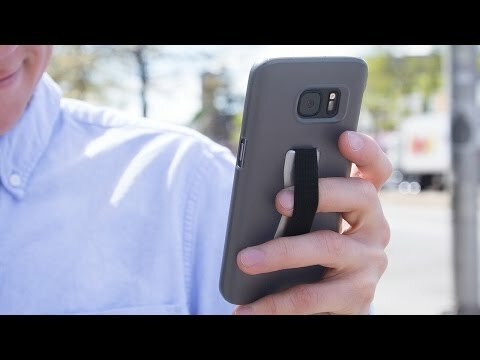 This elastic hand grip for your phone is cleverly simple—slip your fingers through the elastic for secure, one-handed phone holding. The design lets you reach all four corners of your screen. To free up your fingers, flip it over to carry drinks or grocery bags while keeping hold of your device. Works on tablets, too. 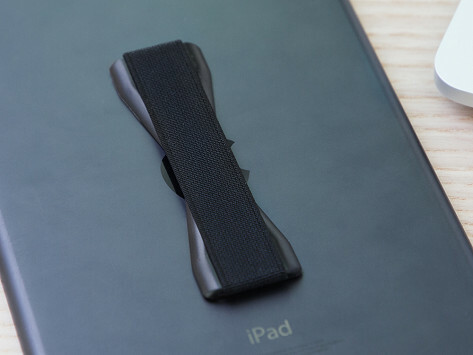 Great for larger smartphones and tablets, holds up to 18 lbs. Dimensions: 3.75" x 1.25" x 0.1"
Easy to attach and works better than I could have hoped. Highly recommended. Worth every cent. I was going to return for smaller size. Once I checked it out, I adhered it on a slant. IPhone 8+ with otterbox. It fits perfectly. And the angle is actually more comfortable. Love these. Nice relief of hand stress when attached to phone. Can be rotated to back of fingers/hand if on speaker and do other things. I am so glad I purchased this to use with my iPad. It makes it so much more easy and convenient to hold. No more hand cramps.